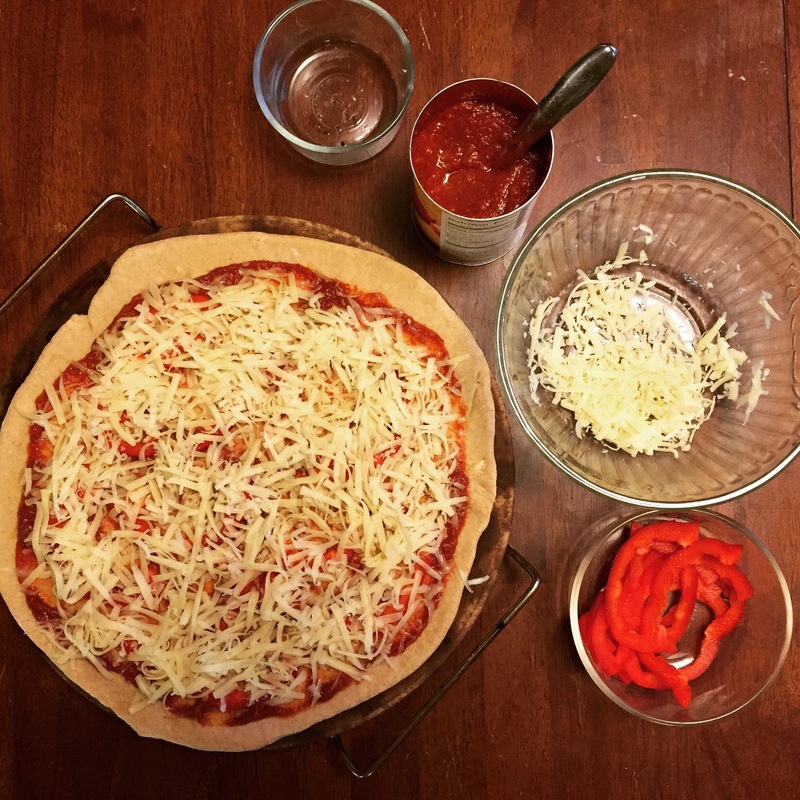 If you follow me on Instagram you might have seen the homemade pizza I made a couple weekends ago. I hadn’t made it in forever and really enjoyed putting it all together on a warm Sunday evening while my family played outside. 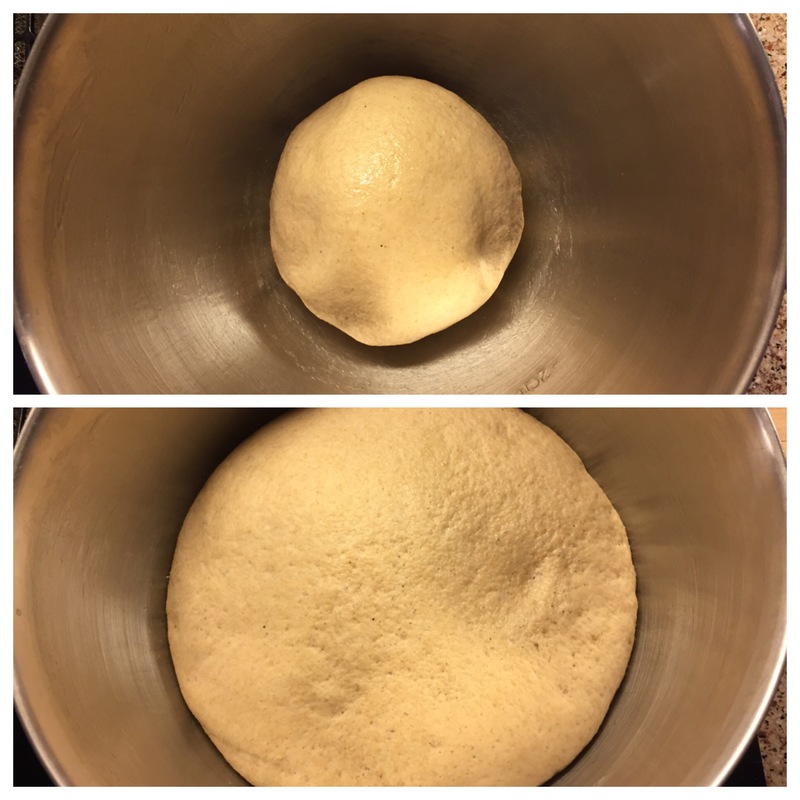 I’ve posted several blogs about homemade pizza before but as I looked back through them I realized I never posted any detail on the actual dough-making process. Homemade pizza dough is actually really easy to make. It only requires one rise and not much shaping. Pizza dough is the gateway to homemade bread! Makes enough for two thick crust pizzas, three thin crust pizzas or one giant pizza in a jelly roll pan. Combine water, oil, sugar and salt in a large mixing bowl. Sprinkle yeast over water mixture and stir until dissolved. Gradually add flour, mixing well after each addition until dough is smooth and combined. I use my Kitchen Aid mixer to make my pizza dough. First I combine everything by hand using a wooden spoon, including the first three cups of flour (one at a time). At that point, the dough gets to tough to mix by hand. I snap the bowl into my mixer and switch to the dough hook to incorporate the last cup of flour. 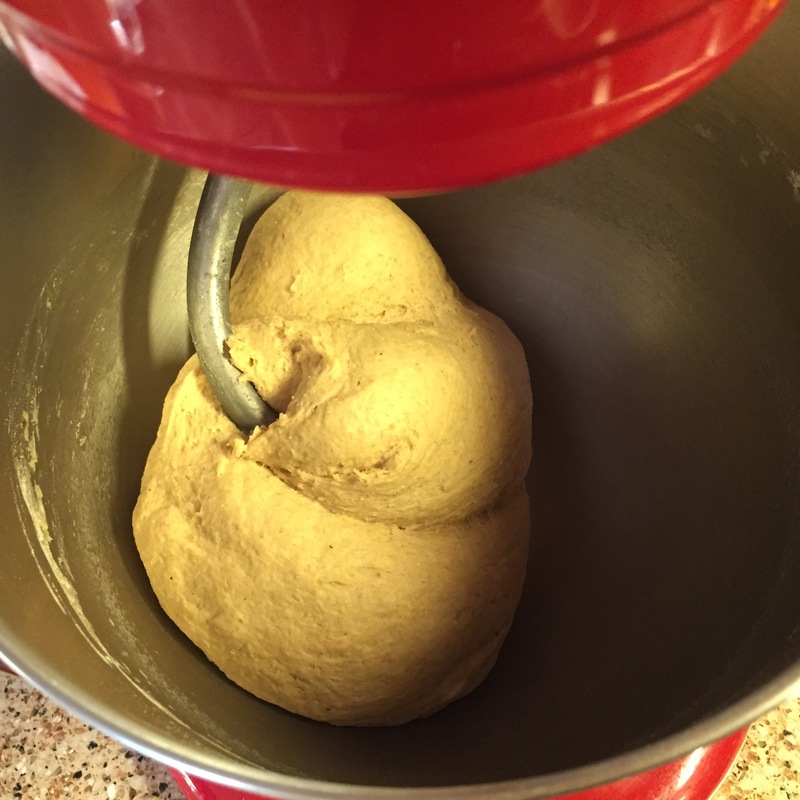 Once the flour is incorporated the dough should start to form a ball and pull away from the sides of the bowl as you can see in the picture below. If the dough continues to stick to the bowl, add flour a little bit at a time until the ball starts to form. The amount of flour needed can depend on a lot of things – temperature, altitude, humidity, etc. This time I needed 4 cups exactly and the dough turned out perfect. Once the dough forms a ball and pulls away from the bowl, I turn my timer on for 12 minutes and let the dough hook continue to kneed the dough. I peek at it every few minutes to make sure it doesn’t start to stick. The extended kneeding time makes the dough nice and elastic which will give you a chewy pizza crust. After the kneeding is finished I pull the dough off the hook and form the dough into a smooth ball with my hands. I place the dough face down in a large bowl I previously greased with olive oil and then flip it over so all sides are greased. The bowl is covered and left alone for an hour to rise. The dough should approximately double in size. Tip: place the large bowl on top of a smaller bowl with hot tap water to help the dough rise. Once the rise time is complete, it’s time to make the pizzas! 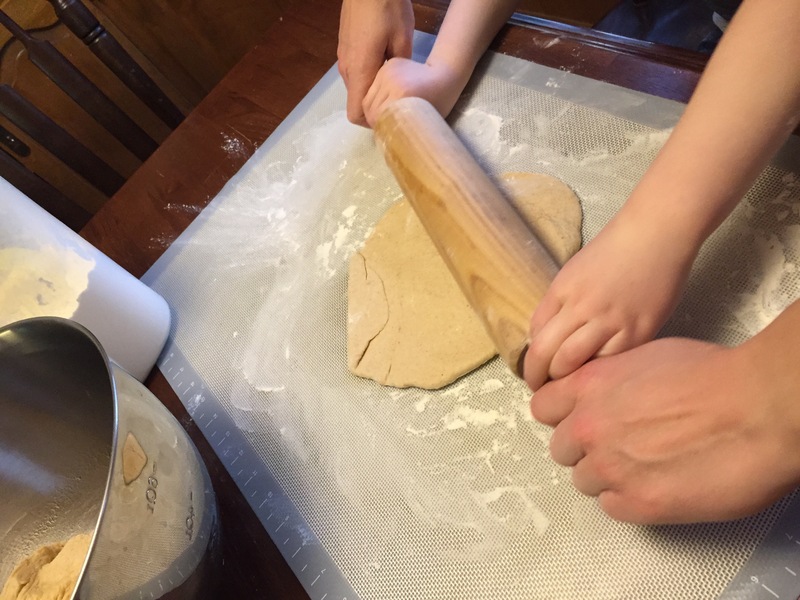 Prepare a flat surface to roll out the dough. I use a silicone pastry mat but you can use a clean counter or table too. Divide the dough into the number of pizzas you want to make. Start by patting the dough out into a circle, then switch to a rolling pin to get it to the desired thickness. This is a nice time to get little hands involved if you have them. I usually let my boys make their own personal pizzas to keep them from fighting over who gets what. Once the dough is rolled and shaped the way you want, place it on your pizza stone or pan. Dry bake at 450 degrees F for 5 minutes. No sauce or toppings yet, just the dough. Then remove the crust from the oven and very carefully add sauce and cheese and toppings. Remember your pizza crust and pan will be hot! This time I used a store bought sauce by Muir Glen (it was on sale!) but if you want to make your own sauce, here is an easy recipe. Return the fully topped pizza to the 450 degree F oven for 10-12 minutes. Bake until the cheese is melted and the crust starts to brown. Remove from oven, cut and serve. This dough can also be used to make breadsticks. Roll out the dough to any shape, then score it with a pizza cutter. Brush with olive oil and sprinkle with Italian herbs or garlic or cheese. Bake at 450 degrees F for about 10 minutes or until they start to brown. What are your favorite toppings? I am usually pretty lame and like plain cheese the best. Sometimes a few veggies make the cut.